In-town convenience and gracious accommodations make the perfect combination for your stay in Gettysburg. 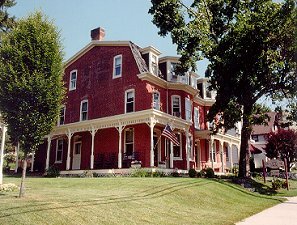 The Brickhouse Inn, located in Gettysburg's historic district offers ten guest rooms including two suites with private porch and two fireplace rooms. Rooms are named for stated represented in the battle at Gettysburg and have private baths. Room rates are $105-$155, double occupancy. Rates are subject to state and local taxes. Additional people in rooms which will accommodate them are $25. We accept VISA, MasterCard, Discover, American Express, cash or check. The Brickhouse Inn is a non-smoking property. Well mannered children are welcome in our suites. Guests enjoy a freshly prepared full breakfast each morning that always includes the house specialty, Pennsylvania Dutch Shoo Fly pie. The Brickhouse Inn is located within walking distance of restaurants, shops, the National Park Visitor Center and parts of the battlefield. Innkeepers Craig and Marion Schmitz look forward to welcoming you to their home and helping travelers enjoy their visit to Gettysburg.